Please tell me the title grabbed your attention...? I had to come up with something suitable fitting for this concoction. Simplicity at it's finest. This will probably be my last pre-Valentines pink post. I'm not even a lovey duvey kind of girl. I think I've simply liked making pink things. I hope you do too! However you happen to be celebrating On Friday...if indeed at all, I hope you enjoy your Valentines Day. For all those singletons out there, how about a booking a massage or a bubbly bath with oils and a face mask. I've been trying to find time for a bit of self-love as I know I don't prioritise 'me' time nearly as much as I should. Blend all ingredients together until smooth- bout don't over blend as the ice-cream consistency will begin to soften. 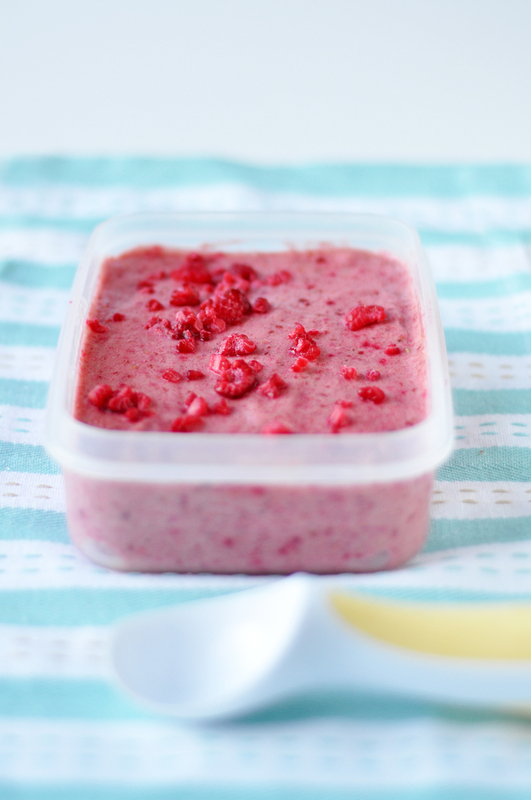 I added most of the raspberries into the blend, then added at the last few for decoration. You can serve this immediately as a soft serve or spread into a tub and freeze for a few hours to serve with a scoop. Because this ice-cream uses a banana base, there is no need for an ice cream maker and the ice cream won't form icy crystals as some ice creams can tend to. Winner! Ramp up the Red.... for the British Heart Foundation!